* Note: this document describes how to install Team Password Manager if your server has all the required components. Check the requirements document to learn more about them. 1. Install the ionCube Loader. 2. Create the database in MySQL. 3. Upload the file to the server, decompress and place on web root. 4. Fill in the database parameters in config.php. 6. 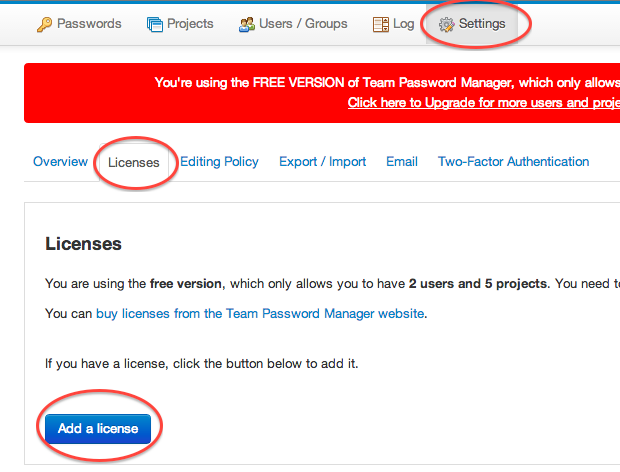 Register licenses (optional): click on the “Settings” option and the “Add a license”. 7. Place files outside of webroot (optional). See folder.php. 8. Make the 'import' folder writable by the web server. 9. Make the 'uploads' folder writable by the web server. Download the ionCube Loader Wizard (http://www.ioncube.com/loader-wizard/loader-wizard.zip or http://www.ioncube.com/loader-wizard/loader-wizard.tgz). Decompress and copy the wizard script (loader-wizard.php) into your web server. Open the script on your browser and follow instructions. Important: at the end of this step (or at the end of the install process), make sure you delete the phpinfo file. It is not needed for Team Password Manager to run and it's giving away information about your server. Select "Options file" in the left sidebar, under "INSTANCE". Select the "Security" tab of the Options file. Restart the MySQL server after doing these changes. You have to create the database that will store Team Password Manager data. Make sure the database user has enough privileges to create tables and insert/delete data. These commands create a database called tpm_database and a user called tpm_user with password tpm_password with all privileges on tpm_database. Decompress the Team Password Manager file (teampasswordmanager_x.x.x.zip) and upload the resulting files and folders to the server web root. - CONFIG_HOSTNAME: hostname of the machine where the database executes. Usually localhost. - CONFIG_USERNAME: username to access the database server and the database created in step 2. - CONFIG_PASSWORD: the password for the username. There needs to be a password, a blank one is not valid. - CONFIG_DATABASE: the name of the database created in step 2. If everything is correct you have now a working Team Password Manager system. This is the Free Version, so you only have two users and a maximum of five projects. If you need more users and projects you should purchase one or more licenses and register them. If you get the Internal Server Error 500 when executing the installer, see the document called Troubleshooting Internal Server Error 500. Log into Team Password Manager with the user created on step 5 by the installer and click on “Settings” on the top menu. Go to the “Licenses” tab, click “Add a license” and fill in the license data sent to you by e-mail. For increased security you can place most of the files of Team Password Manager outside webroot, thus protecting them from direct Internet access. The files that need to be “visible” are: index.php, folder.php, the css folder and the import folder. All the other files and folders can be located anywhere else on your system. This location is then entered in the APP_FOLDER parameter on the folder.php file. See folder.php for more instructions. This folder is used by the import process. Give it 666 or 777 permissions so that Team Password Manager can write in it. This folder is used to store files uploaded in passwords and projects. Give it 666 or 777 permissions so that Team Password Manager can write in it. You can also change its default location. Check config.php.